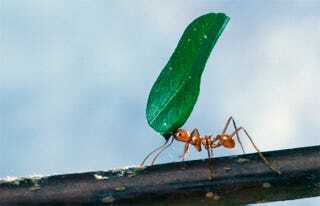 This adorable little ant can be trusted to carry quite a lot on its back in the interest of the common good. In that way, it's surprisingly similar to the cells of your immune system, as researchers from MIT and Harvard revealed earlier this month. They've found a way to hook synthetic patches to the surface of B and T cells — and to control the movements of those cells with magnetic fields. Armed with these so-called "backpacks," lymphocytes can now identify growing tumors and infections, as well as personally (or cellularly?) deliver treatments to ailing cells. This could be the first crest of a wave of revolutionary new school supplies in the world of tissue engineering.